The largest party in the European Parliament, the EPP, has nominated Sentsov for the annual Sakharov Prize for Freedom of Thought. Today, 5 October 2018, is day 145 of the Ukrainian filmmaker’s hunger strike for the release of Crimean Tatar activists. The Sakharov Prize for Freedom of Thought is awarded every year by the European Parliament. It was established in 1988 to honour individuals and organizations defending human rights and fundamental freedoms. Other EP political groups may also nominate other candidates. Then the special committee members will select a shortlist of three nominees. The final winner of the 2018 Sakharov Prize Laureate will be named in October. In August 2015, a Russian court sentenced Oleg Sentsov to 20 years of imprisonment. He was found guilty of an ‘attempt to organize a ‘cell of Right Sector [Ukrainian right-wing organisation] in Crimea’. The trial was held in the Russian city of Rostov-on-Don, the case was considered by North Caucasus District Military Court. The film director did not admit his guilt. The charge was based on the testimony of Alexey Chyrny and Gennady Afanasiev. In court, Afanasiev withdrew evidence saying that he had been tortured in jail. 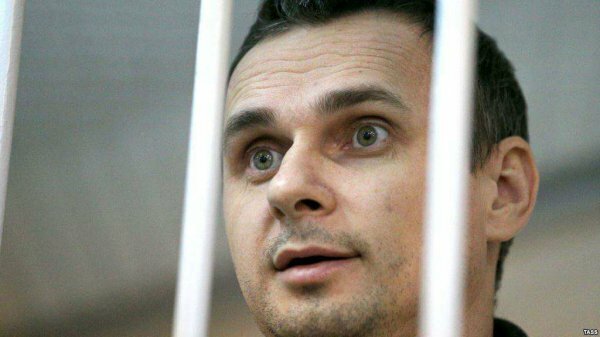 It is impossible to swap Sentsov for any Russian prisoner in Ukraine because after the annexation of Crimea Russia started considering the Ukrainian director a citizen of Russia. The Ukrainian film director, who demands that the Russian authorities release all Ukrainians jailed in Russia and Crimea, went on hunger strike on May, 14. There are 64 Ukrainian prisoners in Russia and Crimea. The 42-year-old prisoner is still not going to ask President Vladimir Putin for pardon. He has recently made his will regarding his works.